Brassed On! York invited the Golden Rail Band to give a concert to round off a 'Come & Play' day at The National Centre For Early Music on Sunday 1st February. Many members of the band had been helping out throughout the day, introducing interested parties young and old to the wonderful world of brass! To showcase young musical talent, 16 year old Lauren from the York Railway Institute Band was invited to perform with the Golden Rail Band as a guest soloist. Lauren treated the auduience to a lovely rendition of 'Another Day' by Andy Norman. After a well-earned hiatus from engagements the Golden Rail Band stepped back into action by providing the music and ambience for the rededication service of the war memorial in Duncombe Place. This moving and well attended ceremony in such a beautiful setting is an honour to be part of and one that the Band appreciates. The following Sunday the Band had the honour of leading the Remembrance Parade and Service in Tadcaster in conjunction with the Royal Air Force Cadets. Once again the weather held fair and the Last Post rang out with conviction to the gathered crowds. The Band returned to Tadcaster at the end of November to entertain the masses at Tadcaster Christmas Market. An excellent opportunity to break out the carols and Christmas cheese as well as pick up a few early presents from the various stalls and start getting into the Christmas spirit. A highlight of the Band’s winter season is always the joint concert with the RI Band and the Development Band which, for the second year running, was held in the RI Hall. The concert began with the Development Band who put on a varied and adventurous programme including a tremendous quintet from five of its youngest players. The Golden Rail Band followed with an entertaining and musically challenging programme that showcased the talents within the Band. The evening continued with the RI Band who impressed the audience with their precision and quality before the evening was drawn to a close by an en masse rendition of ‘We Wish You A Merry Christmas’. The Band built on the successes of the joint concert by hosting our own concert in Bishopthorpe Village Hall. A full programme of carols, marches, medleys and showpieces left both the audience and the Band in full Christmas spirit – a surprise entry to the Bands Christmas Jumper competition from the bass section proved that Christmas miracles do indeed happen! The remainder of December was filled to the brim with carolling at venues such as Scarcroft Primary School, Tesco (Tadcaster Road) and The Marcia Pub (Bishopthorpe). This added nearly £2000 to the Band coffers as well as signalling for many the climax of ‘the most wonderful time of the year’. 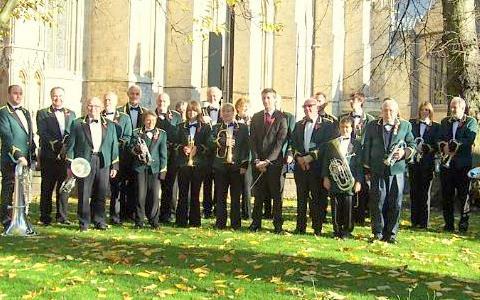 Our summer season of 2014 began in style with our contribution to Malton Band’s Charity play-a-thon. An astounding 24 hours of brass band music in the historic setting of St Michael’s Church was completed to raise funds for the Martin House Hospice. The Golden Rail Band’s contribution was well received and a solid start to our summer programme. Our participation culminated with three joint pieces played together with the Development Band prior to their own excellent set. With the end of May so came one of the Band's regular engagements at Poppleton Children's Sports Day. Against a backdrop of races, picnics, fancy dress and stalls the Band enjoyed a great family day out and took the opportunity to play out a variety of new pieces for the summer programme. As June rolled on the Band once again took to the road marching through Boston Spa to open the festivities at their annual Gala. With only a short set to follow the march, the Band entertained the audience with highlights including Salute to Sullivan, Mary Poppins medley and solos from the principle cornet and the soprano players. A highlight of the York Brass Band calendar saw Golden Rail contribute to Brassed On! 2014. Spread across two major stages this event features all of York's bands throughout the day including GR Development Band and the RI Band, sister bands of Golden Rail. Whilst Black Dyke also made a contribution the day was stolen for those in Golden Rail by the special honour of performing the world premiere of Eboracum – a march penned by our very own principle Euphonium player Bruce Jackson in homage to the city of York. The Band welcomed their return to West Bank Park’s Summer Fair this year with a varied programme designed to serenade, entice and enthral all those who passed by as they took in the wider sights and sounds of the Show. The audience was appreciative of the sight, sound and enthusiasm of the Band as well as the glorious weather! The Golden Rail Band said goodbye to drummer Nathan Giles, cornet player Trevor Boulton and conductor Nicholas Eastwood with a brilliant concert on the veranda of Brodsworth Hall. Greeted by hundreds of Bank Holiday Monday tourists as well as brass band lovers, the band treated the audience to a delightful concert in the beautiful weather. Here you can see the band performing Adele's Set Fire to the Rain, courtesy of Noel Taylor.